I’ve been working with the Sony FS700 for several weeks before shooting this corporate film in September. 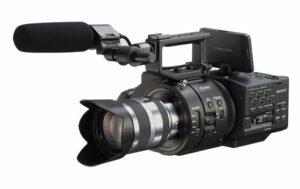 The Sony FS700 brings one unique and very exciting feature, the slow-motion mode that allows you to grab 240 frames worth of HD images per second. At this pricepoint slow motion has never been accessible, it’s wonderful to be able to experiment with this new tool. But there are limitations too: This might not be visible on Vimeo, but the already very weak AVCHD codec of the FS700 (lots of artifacts generally) doesn’t get any better during slow-motion. Also the controls and any external SDI monitoring is disabled in slow-motion mode, so if you’re not connected via hdmi then all you have is the tiny screen on the back of the camera and no technical information at all. It still works somehow though, you’ve got to check after recording. User Minh adds: You can monitor via SDI during high speed recording, but you have to set the SDI output to 60i, and not the usual 24p/30p. While the camera is strong in lowlight situations, I found that the way it treats light is extremely challenging. Like on other Sony cameras you have to be careful with your highlights, but shooting flat didn’t help in getting a filmic look out of this camera. Even with very soft lights and strong post processing it was hard to get away from a videoy look. I wasn’t used to this look and surprised during editing. Not for me. This camera is a little bulky and not very ergonomic in terms of handling. It takes some getting used to and everything is not really where it should be. The design makes run & gun situations very difficult. A very big plus are the internal ND’s though. While it’s not the ideal camera for me personally it also has some plus points like the slow motion function that would make me consider it for a second project or some specific shoots. This is a camera you have to run a full test on before you should use it, because it gets better when you know its weaknesses and can adjust for example your lighting setup and accessories accordingly. I would not use the flat profiles unless you have them tuned to your workflow or really need them for your scene. I have this camera and I’ve always been able to monitor though my HDMI SmallHD during high speed recording. I wonder why yours seem to shut off? Interesting. I have only been using it via SDI. You can monitor via SDI during high speed recording, but you have to set the SDI output to 60i, and not the usual 24p/30p. I own one and the delay on an attached HD monitor – via SDI or HDMI when in 24p recording is unacceptable. Simply put your hand in front of the lens and quickly pan on and off of it while using an external monitor and you’ll see what i mean. Hi, very nice video. Wich PP have you used? A custom one? I love the balanced image you’ve got. Thanks! I used one of the cine presets and altered them in trying to make it less responsive to highlights. I couldn’t do much. I don’t know which presets are out there now, but I would highly recomming using a proofed profile that can be de-lutted afterwards to get correct colors and gamma curve matching your post processing workflow. Really don’t tweak in the color profiles, you will have a hard time getting it right at the end. Make a test on this workflow before using the camera.